Celtic must retain the bulk of the current squad to make progress in the Champions League, according to defender Mikael Lustig. The Sweden international says the club's European nights have been the highlight of his career. And he feels the side can improve upon the solitary win and last-placed finish in last season's Champions League. Lustig described his recent four-month lay-off following surgery as his toughest spell in football. The 27-year-old returned to action in the 6-0 drubbing of Inverness CT on Sunday and expressed relief at playing again. "I've never been out for more than two or three weeks before so four months is a long time," he said. "The timing of (the injury) was quite good as we went out of the World Cup with Sweden, the Champions League was over and it was winter. "We have a quite young squad and, hopefully, the players are getting better and wiser every year. "If we can keep most of the squad then we can look forward to a really good season." 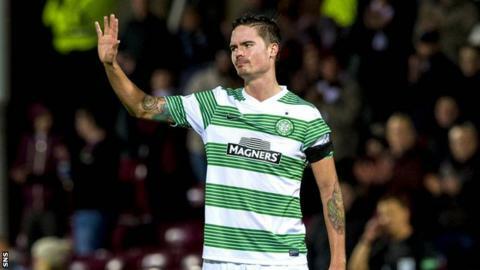 On Celtic's Champions League campaign, Lustig said: "Three points isn't good enough. "To play in the Champions League is really hard. Hopefully, we can get in next year as well. "We've been in the Champions League two years in a row and, for me, it's the most incredible thing I've done football-wise. "That's the main goal and it's [the qualifying bid] going to start straight away in July." With Neil Lennon's men stumbling in the Scottish Cup and League Cup this term, Lustig conceded their displays in the domestic cups had not been good enough. "We want to play in finals and win titles. We weren't close in the League Cup and got knocked out in the quarter finals in the Scottish Cup; it's not good enough for a club like Celtic." Lustig is disappointed to see assistant boss Johan Mjallby depart the club for pastures new and says his fellow Swede has been "really important for us". "Of course, it's a tough decision. We have [assistant] Danny McGrain, who has also played there [in defence] and has also been a big help for us there."